Somewhere along the way it all got twisted. Somehow, car shows devolved from gatherings of the talented and inspired into mad assemblies of competitive lust. Representing your crew and area code, working towards a magazine photo shoot and cheap sponsorships. Darkened convention center halls, fog machines and girls seeking the MTV lottery. Remember when shows were about getting together with people from across town, county and state, and checking the local flavor? When cats took time to explain how they did a wire tuck instead of telling you to Google it? We remember those days. And we’re bringing them back. One/One isn’t reinventing the car show; it’s refining it. 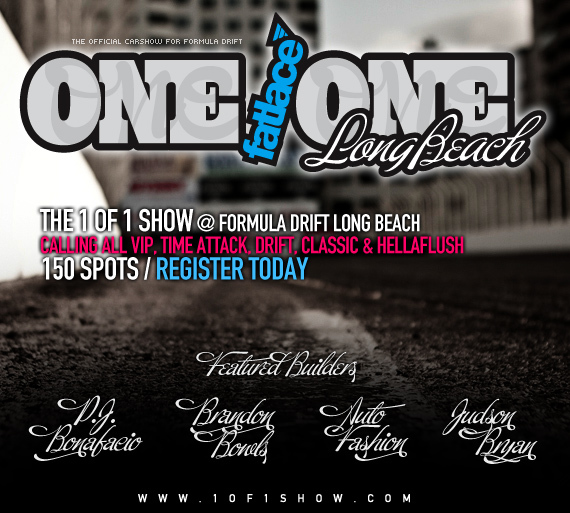 Come see how at the opening round of the 2010 Formula D season, April 9-10, at the Long Beach Grand Prix. One/One will be showcasing 4 of today’s top builders from Southern California in an open forum, taking questions from the audience. No pretense. All passion. Sharing ideas, passing knowledge. The infamous PJ Bonafacio and his classic cars, Brandon from Bowls, San Diego’s own, Auto Fashion, and Judson Bryan from JDM EGO. They’ll all be displaying their latest creations and will be around to talk about their builds. We’ll have awards. Everyone appreciates recognition for their efforts, even better if it helps offset some of the build costs. But trophies aren’t what car shows are about. Don’t think we’re just trippin’ on nostalgia. We’ve got the latest goods from the hottest hands. We’ve got DJs you HAVE heard of. We’re Bringing the Ruckus, one of the most contemporary trends out of L.A., via Japan. And the Gallery, where you can see VIP, Classic, Time Attack/Drift, and Flushed cars. 150 Spots where we’ll divide the cars up by style. If you’re a team wanting to display together, we can do that too. There will also be a Motorcycle/Ruckus category. Limited space is available for car show competitors and teams. We’ll be hand selecting “the best of the best” from each region on the Formula Drift Tour. Please tell us about your love for your car and we hope to see you at the next event. Even if you don’t make it into the show due to limited space, we’d still love to meet you and talk to you at the show. We love cars too, and we’ll be at every show, personally. Pre-registration starts today. $35 per car which includes 2 tickets to both the show and drift event. $20 per ruckus which includes 1 ticket.